President Chris Dondanville conducts a pre-flight inspection. 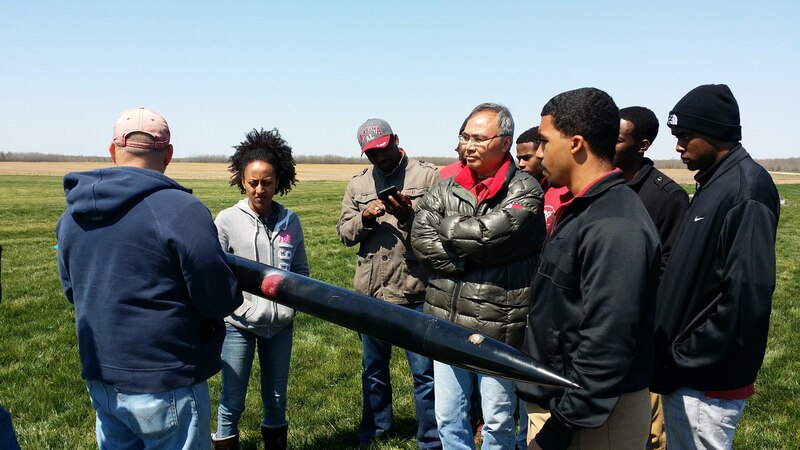 The rocket was constructed by the team from Alabama A&M University. The rocket weighed 14 pounds and was loaded with a J295 with a target altitude of 3500 feet. The flight was successful! Anyone is welcome to bring their rockets to a club launch and fly with us! Members of MC2 and HARA fly for free. Non-members must pay a launch fee of $5.00 per flier (unlimited flights). Anyone seeking to fly a high-power motor (H or higher) must be a member in good standing of either the National Association of Rocketry or the Tripoli Rocketry Association. High-power fliers must also possess the appropriate level of certification for either association. The Range Safety Officer (RSO) reserves the right to ask for proof of TRA or NAR membership as well as proof of certification. Please notify us in advance if you are planning to seek certification at the launch so that we can make sure that the appropriate resources and personnel are available. Southern Thunder is a special event and primary fundraiser for MC2 and HARA. The registration fees must be paid by all fliers regardless of club affiliation. Launch times are generally from 10:00 A.M. until 5:00 P.M.
Field set up generally begins around 9:00 A.M. Setup takes 30 to 40 minutes (volunteers are welcome!). Immediately following setup is a mandatory briefing for all flyers at the RSO tent. SKIDMARK MOTORS: To protect the sod, the RSO makes the decision to allow or prohibit these motors based on the current conditions at the site. The decision is announced at the mandatory briefing. New to sport rocketry or the Manchester Launch Site? Review our Rocket Range Procedures.